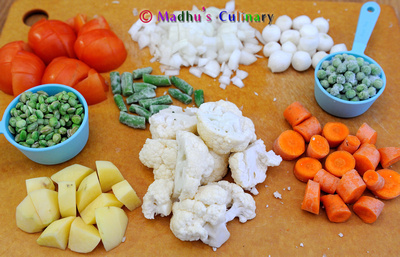 Bisibelabath ->Suvayo Suvai | Simple Vegetarian Recipes, Easy to prepare and healthy to eat! Bisibelabath is the perfect dish for any party and potluck. This is the favorite dish in my family. Take a pressure cooker; cook the rice and toor dal together for 4 whistles using 4 -5 cups of water. 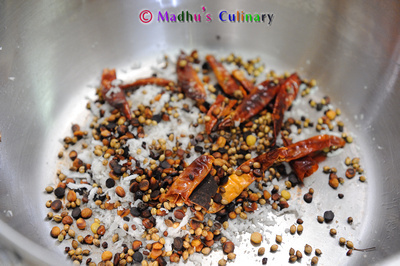 Take a kadai, add few drops of oil, and add the channa dal, cinnamon stick, coriander seeds, red chilies, fenugreek seeds, cardamom and cloves. Fry all until golden color. 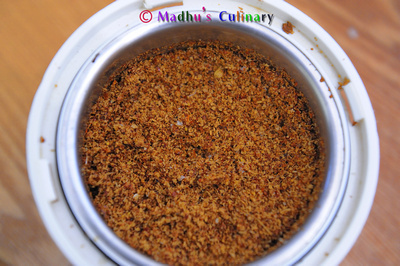 Finally add the grated coconut and fry it for few minutes. Make sure doesn’t burn. Grind all the sauted items in to powder using a mixie. Take a big pan, add 2 tbsp of oil, when it’s hot add the chopped onion and shallot and stir well. Cook it until golden color. 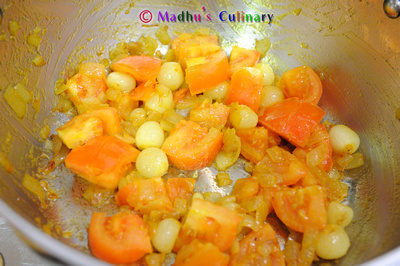 Add turmeric powder and hing mix it well. Add the chopped tomato and mix well. Add all the chopped veggies and add 2 cups of water. Let it half cooked. Then add the tamarind juice and boil it for 2 minutes. Add the salt and the above ground spice mixture and mix it well. Cook until all the veggies are tender. Cook it in the medium heat. Then add the cooked rice and dal and mix it well. Add water, if necessary. Let it cook for few minutes. Splutter the mustard seeds in ghee/butter add the curry leaves and roast the cashew nuts in the ghee/butter. Add this to the rice mixture. If you want you can add more ghee/butter to your taste. 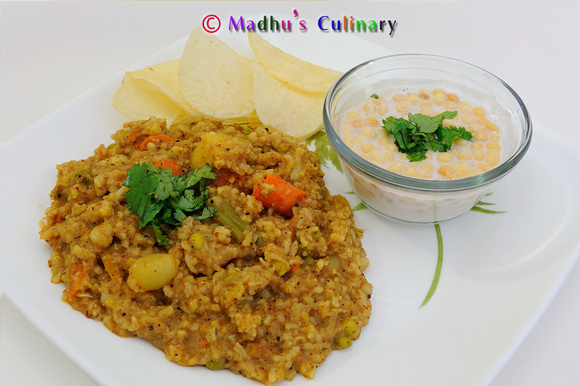 Serve it hot with raita and chips/papad. The recipes are simple, yet alluring. I shall certainly try some of them and revert with my comments, for whatever they are worth!